In part 1 of this series, titled ‘How to findthe right SEO keywords for your online store’, we showed you a simple method for finding the best keywords for your online store. Now that you have your keywords, we are going to look at one of my favorite subjects: how to structure a website for optimal SEO. Website structure for ecommerce sites centers on category organization, but you need to also consider the user experience. • A spreadsheet, such as an Excel document, where you can play around with your keywords. • An Open Source mind mapping tool called FreeMind that is free and compatible with all operating systems. 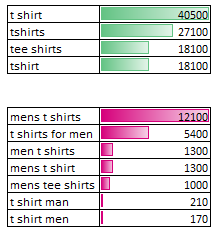 In this article, I’m using the example of keywords related to T-shirts. I have identified almost 50 keywords–a mix of British and American English–and collected data on search volumes using Google AdWords Keyword Tool. How many keywords should I have? There is no hard and fast rule for this; it depends on you and your online store. A simple website with a limited number of pages will have only a few keywords, while a larger one will have more, and so on and so forth. According to Google, search volume corresponds to the average monthly number of searches made for a particular keyword (entered into Google only) over the past 12 months, for the given language and location. 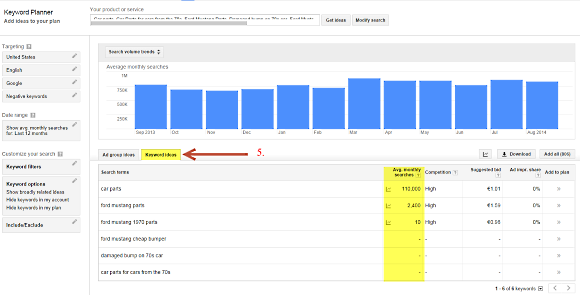 The first thing we notice is that all keywords are not created equal in terms of search volume. Generally speaking, the higher the keyword search volume, the more competition there will be, making it more difficult for you to appear on the first page of Google search results. Similar keywords are combined to form category groups for my online store. From the homepage, I reach the category pages to find any T-shirt I may be interested in. Do I have enough categories to satisfy my shoppers’ needs? Could I, for example, combine the [style] and [gender] filters? 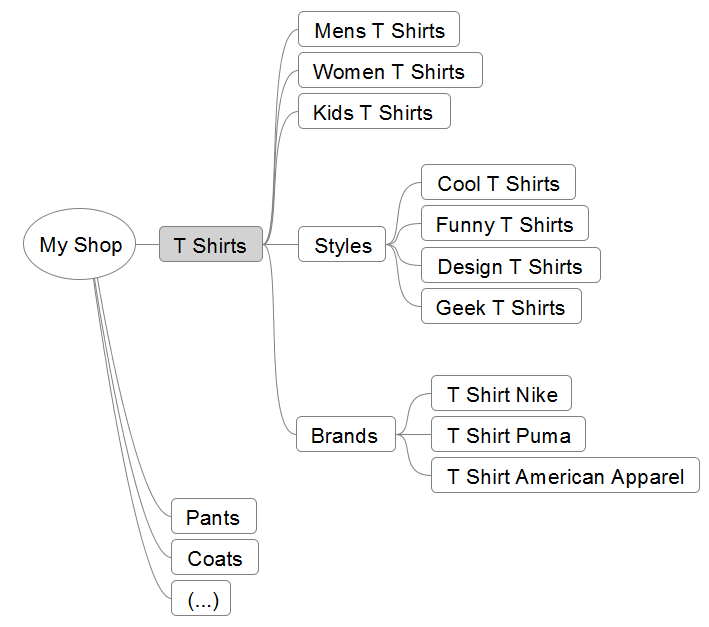 Looking back at my first mind map, I realized that users cannot access pages like ‘Geek T-shirts for Men’ or ‘Cool T-shirts for Women’. With this in mind, I updated my mind map to include new categories, to benefits both users and SEO. For clarity, I showed only the combination of [style] and [gender] categories here, but of course you can combine [brands] or [colors], etc., to create even more pages. Imagine that a visitor arrives on your website through Google after searching for ‘Cool T-shirts’, and wants to filter the results by [gender]. Situations like this highlights the importance of having a navigational structure that guides users toward similar pages or other pages of interest. In the diagram above, arrows are used to represent lateral navigation. Remember that Google isn’t the one buying products from your store, but rather the shoppers searching for your products. So, always prioritize users over search engine optimization. The idea is to find a compromise between being SEO-friendly and user-friendly. When you think you have the right structure, get to work integrating these categories into your WorldMart store! If you need help, check out this category creation tutorial from Level Up Tuts. Did you know that 75% of users never scroll past the first page of search results? Or that 70-80% of users ignore the paid ads, focusing on the organic results? In other words, SEO plays an important role in directing potential customers to your online store. In this two part article, we will show you how to find the right keywords for your online store then guide you through using them correctly for the best search ranking. Today we’ll start by helping you optimize your traffic with part one of the SEO keyword guide for your online store. SEO, search engine optimization, is defined asa set of “industry standards for creating content and web development to help search engines associate your website with relevant keywords.” According to Business Insider, there are over 644 million active websites, so it’s important to use a great SEO strategy to stand out among your competition. Sure many SEO practices are web development centered but there are tons of simple ways to improve your SEO efforts just by using keywords effectively. Let’s show you how. 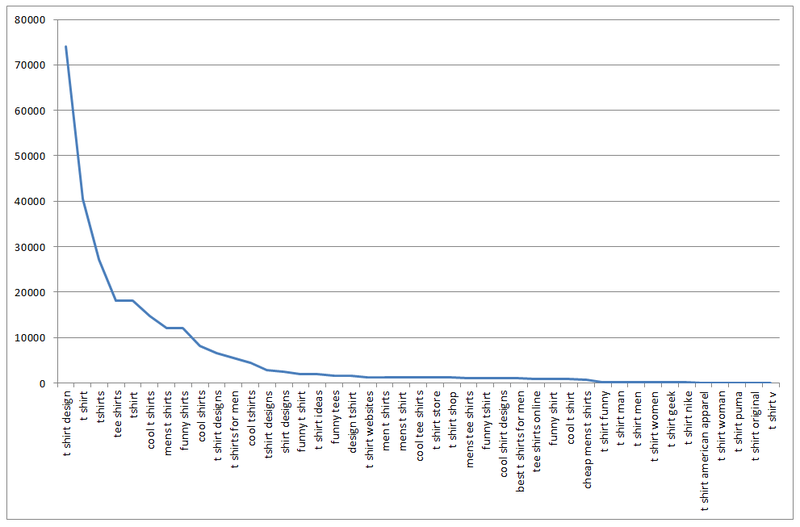 Which keywords bring qualified traffic? Ask yourself these two simple questions to find the keywords that fit your business best. There is a 100% chance that the answers will be the keywords you are looking for. What do you sell on your ecommerce website? What kind of keywords might customers search in order to find your product(s)? Throughout this article, we will provide examples using an online store that sells car parts. View Google’s suggestions under the Keyword Ideas tab. Want more way to find keywords? 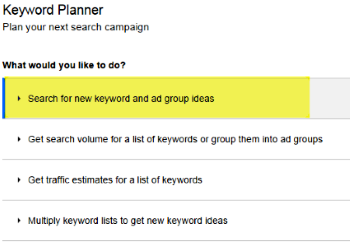 Check out Search Engine Land’s giant list of keyword tools to generate even more suggestions. Did you find the first part of our keyword guide to SEO helpful? Tell us in the comments below and don’t hesitate to ask questions! 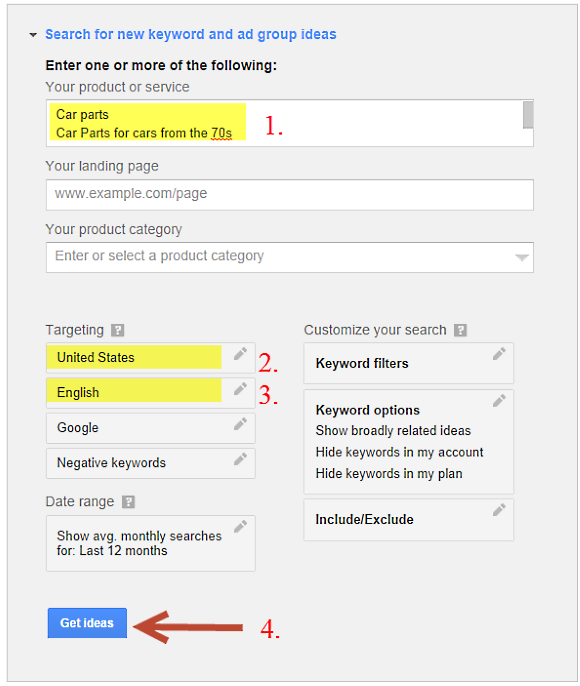 Ready to land on Google’s first page search results for relevant keywords? Stay tuned for the second part of our SEO keyword guide. In the meantime, Register Free Trial With WorldMart shopping cart software to take advantage of our advanced, built-in SEO features. So you have an online store with great products, now what? The success of your business depends on bringing in customers. But how can you attract those customers without cash flow and brand recognition? Growth hacking. Simply put, growth hacking tactics are an inexpensive and innovative alternative to traditional marketing. And it’s how you can build awareness and reduce your customer acquisition costs to nearly $0. Growth hacking has undoubtedly been the driving force behind some of the most successful startups. Companies such as Air B&B, YouTube, Dropbox and Groupon are all early adopters of growth hacking strategies. Clearly, it’s working. Now, how can you do it too? Let’s review 3 simple growth hacks that ecommerce sites use to grow their customer base. Through social media, search engine, rich content and viral marketing, you’ll be able to squeeze more out of the time and effort spent acquiring new customers. Why it works: Refer a friend programs develop a sense of reciprocity between you and your customer. Since generally refer a friend programs require that the referral makes a purchase/subscribes, a customer feels obliged to refer a qualified lead to guarantee they will be rewarded. Why it works: Building relationships and incentivizing influencers such as bloggers, journalists, experts to give you coverage introduces your online business to their entire audience. If you picked the right influencers then you just opened the doors to an exponential number of potential customers. This strategy also creates back links to your website, augmenting your SEO efforts. Where to start: Start small. Convincing a major influencer to give you coverage doesn’t happen over night. Begin by reaching out to non-celebrity bloggers that have a strong social media presence then work your way to the top! Why it works: You’re connecting with social media users that are speaking out about your specific industry, product or niche market. This means they are already interested! By providing personal attention with a helpful response, you are presenting your business as a valuable resource. How to do it: Do a quick daily search on Twitter for #hashtags and conversations related to your business. Then tweet at these prospects that have used the hashtag with helpful advice and a link to your site or a relevant blog post. You should focus on being resourceful rather than salesy. You don’t want these potential customers to think your spamming them. For a complete guide, check out Hubspot’s Social Prospecting Workbook. Customer acquisition is all about finding what works best for your target audience. It’s also an area of your business where you should constantly be testing new strategies. Who knows, it might be one of these growth hacks that turn your business into a hit! Have you tried any growth hacking tactics for customer acquisition? Share your experience and advice in the comments below. With over 2.5 crore online buyers and more than 21.3 crore internet users in the country, India holds great potential for many online business owners. Indian consumers are now spending a significant amount of their time online, according to a recent study conducted by Frost & Sullivan. More than 60% of the Internet users in India spend four hours and more a day for entertainment, networking, shopping and etc. It was discovered that nearly 50% of young urban Indians spend more than two hours on social media sites daily. This suggests that Indian consumers are highly active online, allowing business owners to reach out to them easily. Clearly, Facebook is the most preferred social media sites in India as it crossed the milestone of 100 million active users on 31st March 2014. Out of these Facebook users, 84% of them access it via mobile, which shows that mobile commerce is also growing strongly in the country. Apart from using social media to network and socialize with their friends, Indian consumers are relying on it to make their purchases, be it as informed choices or through peer conditioning. Generally, consumers are influenced by advertisements, product reviews and product launches that they are exposed to while on social media. A survey conducted by Frost & Sullivan indicates that over 40% of the respondents have purchased one or more items after seeing it on a social networking site and many of these purchases were made after seeing the advertisements on social media sites. Business owners generally adopt organic social media as it is low-cost and they do not need to waste their time monitoring the results and returns of their paid social media. However, as your business grow, it is important to explore paid social media such as display advertising or search engine marketing. Paid social media helps business owners to inexpensively get your message to prospects where they are active, which is worth the marketing dollars spent. Brand pages on Facebook are also experiencing a decline in number of fans who see their organic content since they are only targeted at their fan base and those that chanced upon their Facebook page. On the other hand, paid social media allows you to choose your target audience and increase brand awareness. Hence, business owners in India need to think about how to capture their target audience with the right social media tools. Social media is where the customers are at – but to target them effectively is something that business owners in India need to think about.